You are here: Home / Motivating Teachers and School Staff / How Can School Leaders Prevent Teacher Burnout? Teacher burnout is at the opposite end of the spectrum as teacher engagement. So if you want to help avoid teacher burnout, you need to create conditions that promote engagement. There are three core aspects that promote engagement and reduce burnout: Resources, Efficacy, and Demands. As the new school year begins help your teachers see RED. Resources provide the capability to do the work expected and most importantly help reframe and reduce perceptions of job demands. Resources are essential to engagement and most predictive of work engagement under conditions of high demand (like the first few years of teaching). Resources are more than tools needed to do the job. In fact, few job resources have anything to do with physical tools, supplies, equipment, or technology. This is not to say that it is not helpful to have modern technology and equipment needed to teach students, but resources that can help prevent teacher burnout are more than the newest educational tools on the market. Resources refer to the physical, psychological, social, or organizational aspects of the job that has the potential to reduce job demands. They are functional in achieving work goals and stimulating personal growth and achievement. Job resources fulfill basic human needs for relevancy, autonomy, and competency. School districts that provide adequate resources are more likely to create an environment where teachers and staff are likely to dedicate their efforts and abilities to common and demanding tasks. When referring to engagement, there are two types of resources to discuss: job resources and personal resources. Personal resources are positive self-evaluations that are linked to resiliency. Personal resources can also be related to a teacher’s self-confidence in their ability to control and have an impact on the world around them. The lack of resources to meet job demands causes psychological strain in teaching and has a relationship with teacher burnout, which obviously undermines engagement and causes less commitment to the school district. In schools, this strain usually occurs when resources are threatened, lost, or non-existent. Clearly, resources are a critical factor when designing a work environment that is resilient to teacher burnout. Self-efficacy is an individual’s beliefs about personal abilities to perform job-related tasks and produce expected levels of performance at work. When new teachers are assessing their perceived ability or competence, it is really an assessment of their self-efficacy. Self-efficacy influences how much effort new teachers will expend and how long that effort will be sustained. It is one of the most critical factors regarding teacher engagement (and preventing teacher burnout). Self-efficacy has been shown to have a strong relationship with performance. Studies have found the higher a person’s self-efficacy, the more likely they are to take on challenging work, continue their efforts, and use problem- solving strategies when unexpected problems arise. In fact, self-efficacy is a better predictor of work-related performance than traditional predictors of job satisfaction, organizational commitment, personality traits, level of education, previous training and skills, goal setting, and performance feedback interventions. Efficacy levels even affect how quickly newcomers adjust to organizational settings. If you want your teachers to be engaged and motivated, they should have high levels of self-efficacy on critical and common work tasks. Later in this article, we’ll discuss how to build self-efficacy in staff members after they have been hired. Below are some general traits among people with high levels of self-efficacy and lower levels of self-efficacy. Keep in mind these are generalizations, but they are good indicators as you attempt to monitor efficacy levels among the teachers in your buildings. Teachers who have high levels of efficacy will provide the appropriate level of effort, which if executed effectively, is likely to produce successful outcomes and result in teachers who are willing to expand their skill set based on successful past experiences in learning something new. In contrast, teachers who have lower levels of efficacy are likely to cease their efforts prematurely and potentially fail at the task, or, even worse, never attempt the task in the first place. There are multiple factors that can affect self-efficacy in teachers. One factor is individual personality factors, another factor is how well an individual’s skills match job expectations (an effective teacher selection system is worth its weight in gold for this reason alone and we might know some people who can help with that 🙂 The third factor is the effectiveness of the school district’s professional development efforts, both for new teacher and veterans alike. Quality professional development can help bridge the gap in efficacy. Quality teacher selection tools can help minimize the gap even more. When people think of job demands they tend to focus on blue collar work. A roofer sweating out the day hauling heavy shingles on a scorching hot roof. A landscaper hauling carrying loads of material early in the morning until late at night. These are examples of physical demands. While there are some physical demands for teachers (especially for those who teach the youngest students) the more common type of demand that affects new teacher burnout is emotional or mental in nature. Job demands that lead to new teacher burnout are often the numerous tasks teachers need to accomplish with little time to get them finished. Job demands for teachers can also be the difficult interactions with challenging students and parents. These psychological job demands are compounded even further as many teachers carry the weight of student struggles and personal needs home each night- long after the last bell rings for the day. Consistent and unyielding demands can rapidly accelerate new teacher burnout. In fact, the term “emotional labor” exists for people who work in service related roles like teaching. So how can school leaders moderate demands that influence new teacher burnout? Dr. Richard Lazarus, an organizational psychologist from UC Berkeley, established a theory known as the Transactional Theory of Stress that can be used to explain how people perceive demands. He found that people viewed work demands similar to a “glass half full/ half empty” mindset. Lazarus labeled job demands that cause stress and led people to believe they could not accomplish tasks due to lack of skills or knowledge as hindrance demands. In contrast, Dr. Lazarus found some employees saw demands as an opportunity to become more engaged and expand and build upon their existing abilities. He called these challenge demands. To summarize, hindrance demands lead to stress and disengagement, challenge demands can lead to more engaged employees. So what has research said about how leaders can actually affect perceptions? In an article titled, Linking Job Demands and Resources to Employee Engagement and Burnout, organizational psychologist Eean Crawford and his colleagues found that only effective training, experience, and efficacy differentiate how employees perceive challenge demands and hindrance demands. In short, if schools want to know how to get teachers and staff members engaged, one of the most important steps is to ensure professional development is taken seriously, provides multiple opportunities for practice and feedback, and provides clear expectations and priorities for performance. Ensure teachers leave training sessions with the knowledge and ability to apply critical behaviors to common demands that teachers face. Determine the objectives of the professional development sessions that teachers attend, and work to ensure the criteria used to demonstrate proficiency in professional development training is measured for proficiency at the conclusion of the training event and is also part of performance management tools used to develop teachers. The effectiveness of professional development that is related to expected demands teachers face isn’t a satisfaction survey at the conclusion of the training session. Effectiveness should be measured by the level of confidence teachers have to apply what they’ve learned. Instruction in classrooms that fails change how students perceive demands and build efficacy through practice and feedback is pointless, this is also true for professional development for teachers. The start of a new school year seems like an unlikely time to address new teacher burnout and turnover. On the other hand, if it’s not on the radar of school leaders now, it will likely be too late in the spring when many frustrated, new teachers question their choice to work in the school district or even the profession of education. 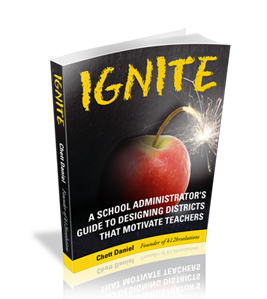 There are multiple factors related to teacher motivation and engagement that we discuss in Ignite: A School Leader’s Guide to Designing Districts that Motivate Teachers that can improve engagement and retention of educators. But if we had to choose three areas that school leaders should focus on early in the school year, we would choose to focus on RED. Resources, efficacy, and demands are three of the most important factors to reducing teacher burnout.